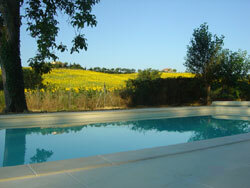 Villa Tre Sorelle is in one of Italy's most beautiful regions, Le Marche, just to the south of Tuscany and Umbria. The region is bordered by the stunning Appenine mountains in the west and the sandy beaches of the Adriatic to the east. Le Marche is an area of outstanding natural beauty with pretty hilltop towns and villages, rolling countryside and the best in fine food and wines. The area is known as 'Italy's best kept secret' and if you pay a visit to the region you will soon understand why. Villa Tre Sorelle is in a beautiful rural area close to the medieval village of Treia and a short distance from the university town of Macerata where the famous sferisterio open air opera takes place in the summer each year. The dual carriageway is about fifteen minutes away providing swift and easy access to the mountains in one direction and the beach in the other. Ancona airport is one hour away and major cities like Rome, Florence or Bologna are all within reach for day trips. Apart from the main villa there is also a small cottage in the garden called 'Il Fratellino' (the Little Brother). Once an outbuilding for smoking meats the structure has been lovingly restored as a charming, self-contained cottage. Il Fratellino is 'one up, one down', with a kitchen and sitting area downstairs and a double-bed and en-suite shower upstairs. The cottage is ideal for large parties needing an extra bed, or as somewhere separate for a Nanny, or for those wanting privacy and intimacy away from the main house. Villa Tre Sorelle is the perfect Italian holiday retreat and comfortably accommodates between two and eight guests at a time.